I’m tired of being told to vote for a candidate who’s “more electable”, as if that’s somehow a valuable proxy in favor of a candidate whose values I share, whose wisdom and judgment I trust, and whose plan I support. I’m tired of being told not to “throw my vote away” by voting for people I’d actually like to see elected. I’m tired of going to war because the pacifist guy wasn’t “electable” enough. I’m tired of watching climate change become irreversible because doing anything meaningful to stop it hasn’t made it to the top of the political expedience dung heap yet. And most of all, I’m tired of telling myself that I’m doing my civic duty by voting for people I don’t want merely because they’re better than the likely alternatives. When I do that, I’m part of the problem. If the point of having citizens vote is because there are a lot of us and we’ll work to make sure the best ideas filter up into government, voting against our own interests is violating the trust the system places in our hands. Governing is done by those who show up, and I’ve been showing up in the wrong camp. So today, I’m resolving to change that. I cast a ballot today for Zephyr Teachout and Tim Wu in NY’s gubernatorial race, not because I think they’ll win, but because I think they should. 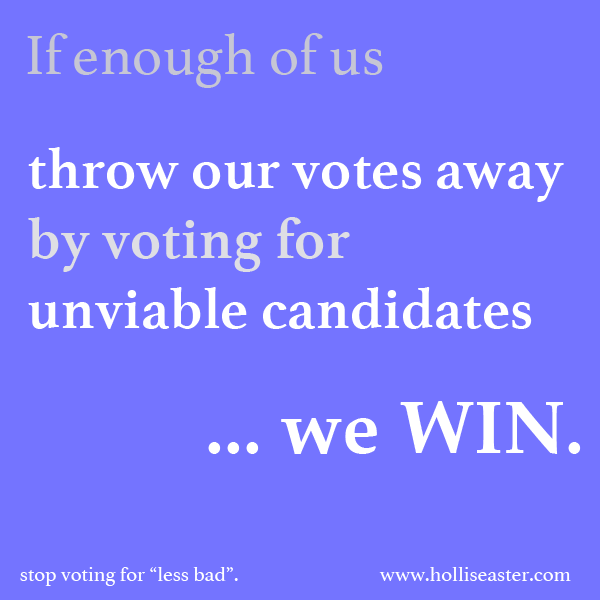 If enough of us throw away our votes on unviable candidates, we win. Let’s get started.